Puerto Rican Culture research papers discuss the history that makes up the culture of Puerto Rico. Puerto Rico is an island in the Caribbean, a territory of the United States, but home to a vibrant culture that mixes elements of Native American, European American, and African influences. Puerto Rico has a history of blending that dates back to Columbus, and the Spanish contact with the native Taino Indian population. Under centuries of Spanish colonization, not only were European and Taino cultures merging into something new, but the importation of African slaves contributed as well. Other groups followed as well, including Chinese laborers, and other Europeans, including Italians, Germans, French and Irish. In 1898, the United States gained control over Puerto Rico following the Spanish-American War, leading the arrival of many U.S. citizens. Because Puerto Rico is a territory, and not a state, residents are U.S. citizens, but also separate from the mainstream of American culture. Puerto Rico is, in many ways, culturally independent. 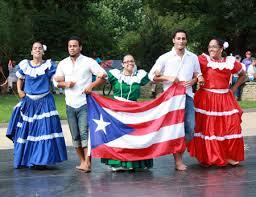 Predominance of the Spanish language, Catholic religion, and Hispanic heritage mark Puerto Rican culture as unique. One of the unique facets of Puerto Rican culture is food. Cocina criolla uses main indigenous ingredients, while combining Spanish, African, and Taino techniques. Puerto Rican food, like Puerto Rican culture, is a mixture of many different ingredients. Homicide in Puerto Rico - A research paper on Homicide in Puerto Rico examines and discusses about 600 murders that occurred in Puerto Rico in the year 2003. Paper Masters writes custom research papers on Puerto Rican Culture and discuss the history that makes up the culture of Puerto Rico.